World War I was one of the deadliest wars in human history. With 40 million casualties, people considered this to be The War to End All Wars. Sadly, this would not be true, as many wars have occurred in the century since then. Unfortunately, as the years go on, many of us don't remember who we fought against in World War I. As a result, many of the people who fought on either side of the battlefield have been forgotten as well. They Shall Not Grow Old is a phenomenal documentary on both levels of storytelling & filmmaking. Narrated by dozens of British servicemen, the film follows the British Armed Forces in World War I, from their entry in 1914 to the end of the war in 1918. 6 million servicemen, some as young as 16 years old, fought bravely for their country: some volunteering, others conscripted, but all united in the fight. Through the entire war, the soldiers experienced various horrors, including trenchfoot, mustard gas, & machine guns, along with so much carnage. These brave men would never be the same for the rest of their lives. Peter Jackson's direction is phenomenal. When you consider all of the work that Jackson put into this film, you realize that it is just absolutely awe-inspiring. Jackson & his crew had to restore all of the 100-year-old footage, then get all of the footage to the standard 24 frames per second, then colorize the footage, & then finally add the voiceover & sounds to the film. The colorization brings these men & these events to life. These are simply not men & events from a long-ago era. These men were like many of us. Also, in lieu of focusing in on specific battles & looking at specific people, Jackson goes for an immersive approach, letting you feel what it was like to be a soldier in World War I. All of this was a miraculous effort, with miraculous execution. This is not only one of the best documentaries of 2018, but it is one of the best documentaries of all time, & it is also certainly the best war documentary. It's a completely immersive look into one of the most horrific moments in world history, & it perfectly honors those men who bravely fought in this historic war. 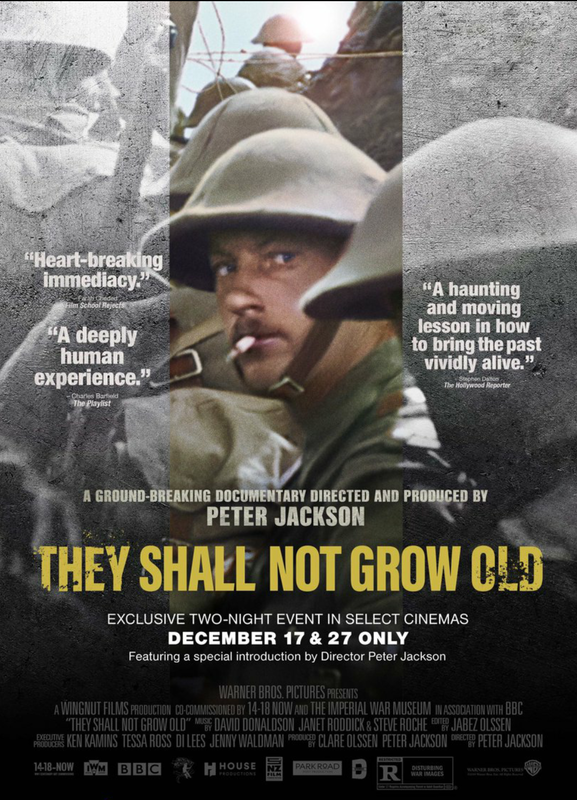 They Shall Not Grow Old was seen by me at the MJR Waterford Digital Cinema 16 in Waterford Township, MI on Saturday, February 2, 2019. It is in theaters everywhere. Its runtime is 99 minutes, & it is rated R for disturbing war images.